Songkran is coming to Thailand - and Bangkok is ready to Party (and get wet)! Songkran is the traditional Thai New Year Festival and as well as being a big National Holiday it also attracts many LGBT tourists to this stunning country, looking to enjoy the celebrations and ‘water throwing’! Songkran is also a big Party Time for the LGBT Community, with the big G-Circuit Dance Parties taking place over the Songkran period. This year, Songkran is from Saturday 13th until Monday 15th April, with the Parties starting on Friday 12th. The G-Circuit Songkran Parties have been going for many years and attract thousands of us wanting to dance and get wet! 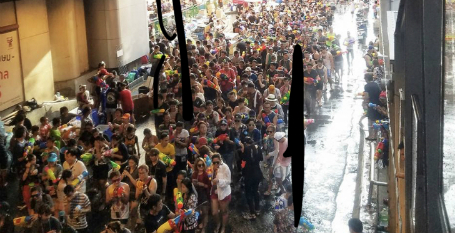 Silom, which is also known as the central LGBT area, is a popular place for the water fights and is great fun - but be prepared to get very wet and join in the fun! Many Locals and Tourists will be 'play water fighting' and some of the water guns are HUGE! During the day, Silom is packed with LGBT people and friends having fun in the heat, keeping cool BY spraying each other with water. As well as the big Dance Parties, there will be lots of other festivities and many of the LGBT venues in Silom will be hosting Songkran Parties. Bangkok’s most popular clubs DJ Station and G Bangkok are likely to be extra busy and for those wanting to dance and enjoy Asia’s top Circuit DJ (and a Fridae favourite), DJ Spectrum K will be at G Bangkok on Friday, Saturday and Sunday, as well as at the Babylon Foam Party on Saturday and Monday, and the Bear Beats Party at the White Rabbit Bar on Monday. Silom’s Soi 4 is home to many LGBT venues and hosts may LGBT-focused Restaurants. A favourite is Fork and Cork, which is at the end of the Soi and allows people to enjoy good food and drinks and watch the craziness outside! Another popular Restaurant with LGBT locals is 88 Eatery and Bar, which serves delicious Thai Fusion food and host Chef Anon is a great source of information on what’s going on. Siloms’s Soi 4 hosts numerous Bars, most of which have seats outside on Terraces where people can watch the crowds - just walk up and down and pick a spot! Bas Bar is a more up-market Bar, serving amazing cocktails and located at the quieter end of the Soi. One of our favourite Bars on Silom Road between DJ Station and G Bangkok is the White Rabbit, which serves great reasonably priced drinks and usually has a live DJ. Bangkok has some of the best Gay nightlife in the world and DJ Station (Silom Soi 2) and G Bangkok (just along from Silom Soi 2) are the two main clubs. DJ Station gets going earlier and the G Bangkok kicks in from midnight. G Bangkok is Asia’s premier Circuit Music Club and hosts Asia’s top Circuit DJ, Spectrum K Friday to Sunday nights. If you’re going to Songkran this year - have fun and get wet!! To add to yr info Song-Kran, a local calendar new year 13/4 - 15/4, is not celebrated only in Thailand but also in other 3 countries such as Laos, Burma and Cambodia with different names with the exception that BKK is a party hub for gay men.